The Pets Overload home has always been viewed as a family. Along the way, we have lost some of our children, but it doesn’t mean that we’ve forgotten about them. This page will be our way of paying tribute to each of our soldiers who we’ve lost over the years and will link to some of our favourite moments with them. Twitch was our first hamster who was left outside of a grocery store near the end of winter. She was a bit of a trouble maker who refused to stop chewing on her cage and got us to do lots of research on alternative cages that she could not escape from. Twitch was a sweet girl who we loved spending time with, she was also the first pet I had ever lost. 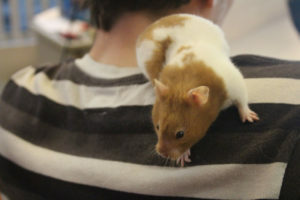 Flub was another pet who we didn’t expect to adopt as he was surrendered at the pet shop I used to work at. Flub joined our other Betta and gave our cat Beau plenty of entertainment and someone to sleep with at night. It was amazing to watch our cat bond so closely to a fish and losing Flub was much more difficult than I imagined even though I experienced fish pass at the pet store. By far Blub was one of the hardest pets to lose as he was the first pet my partner and I co-adopted. 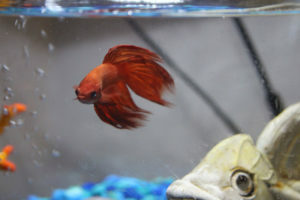 He was given to me by the pet store I worked for as training to become their in-house “fish expert.” Blub was a soldier who took a number of beatings from us. He experienced us trying to learn how to properly change tank water, he lived through 2 drastic moves, he survived Popeye, and throughout all of this, he didn’t stop blowing bubble nests until the very end. 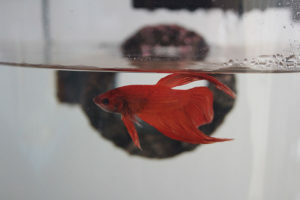 Blub really helped me learn how to be a good pet owner and lived much longer than we had been told Betta Fish live for. I leave you all with a quote that helps me understand that grief is normal and makes sense when losing a pet. I hope you too can take solace in it if you are currently grieving. Sometimes losing a pet is more painful than losing a human because, in the case of the pet, you were not pretending to love it.